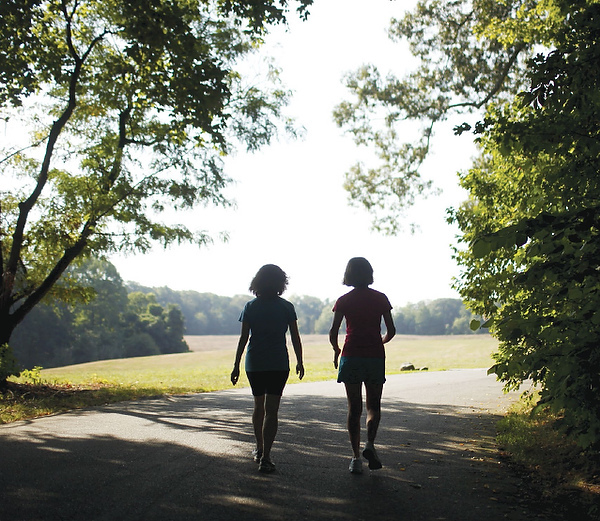 From its trails, meadows and formal gardens to its woods, wetlands and wandering paths, Reynolda Gardens has been a place of magical memories through the years. We are blessed to have the gift of Reynolda Gardens in our community. It is a rare and wonderful treasure to have an estate’s garden, meadow and woodland at our back door, open for free, public use. Surely this was not an issue when the Reynoldses purchased over 1,000 acres with the idea of creating a self-sustainable farm and estate. R.J. Reynolds died shortly after the couple moved to the estate in 1918. 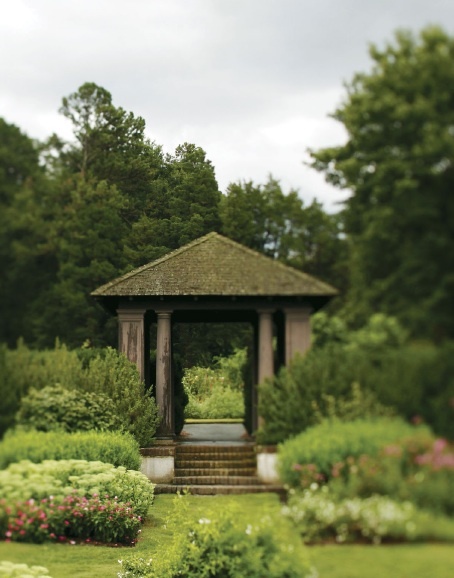 His wife, Katharine, was left to direct operations and proceed with the vision, which included creating the formal gardens that many of us recognize today as Reynolda Gardens. 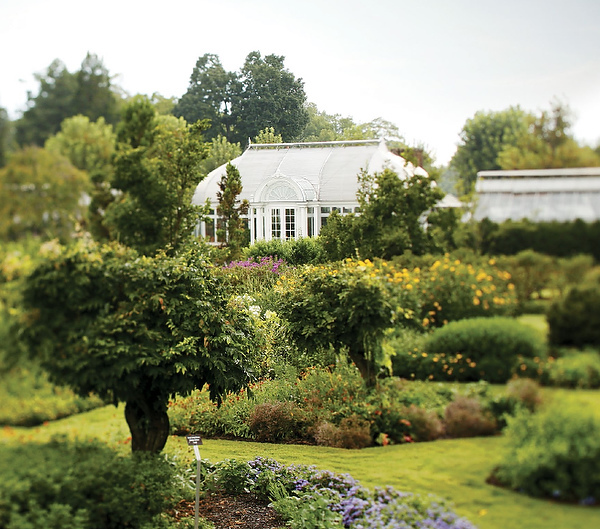 Designed in 1917 by Katharine Reynolds and Thomas Sears, a Harvard-educated landscape architect from Philadelphia, the Gardens comprise almost four acres. They are roughly divided in half with the lower, or greenhouse gardens, a reconstruction of Sears’ original plan and the upper garden dedicated to the cultivation of modern roses, ornamentals and vegetables. 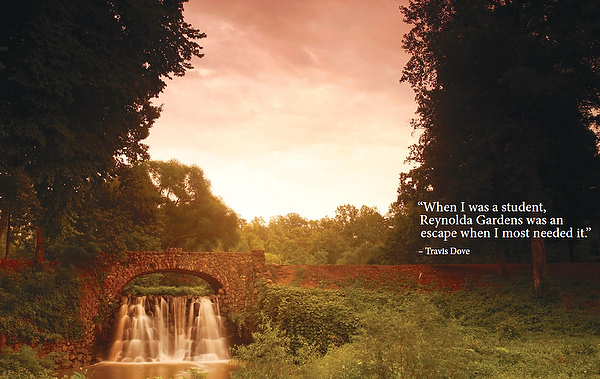 When I first set eyes on Reynolda Gardens I felt a surreal familiarity with the place. I grew up in a row house in suburban Baltimore. Behind my family home a woodland surrounded an estate much like Reynolda with formal gardens terraced and walled, a pond and a scattering of exotic ornamental trees ringing a house larger than anything I could have imagined. By that time the estate was a nursing home, private property that required my scaling a 10-foot-tall chain link fence to undertake stealthy exploration, something I was called to do with magnetic regularity. The similarities between it and Reynolda are multiple, but I believe the attraction to them to be about the same thing: the pursuit of beauty. Beauty may be as necessary to the nourishment of the human soul as food and water are to the sustenance of the body. I believe that all visitors to the Reynolda estate arrive to experience that beauty whether they are walking their dog, studying statistics, tossing a Frisbee on the lawn or strolling through the borders with the one they love. 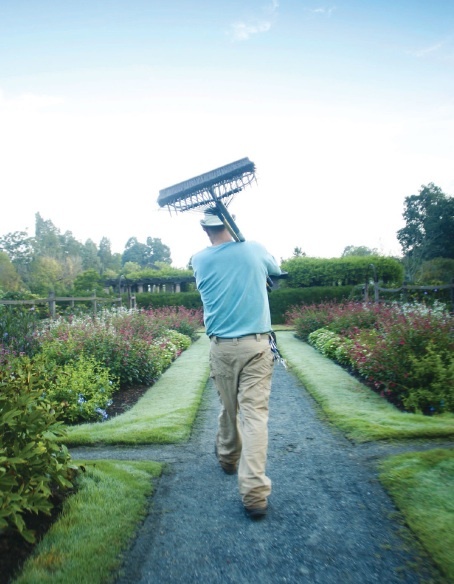 Gardeners are in the business of facilitating beauty. We are not so much creators as we are enablers of beauty. We construct an arena where soil and plant combine with light and water and nature animates the scene. 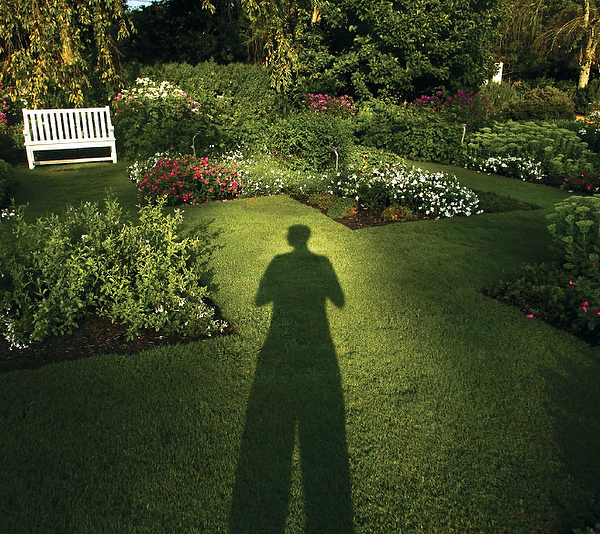 It is a relationship that requires a great deal of humility, for the Gardens are likely to go in several directions and a gardener’s skill is only one of the determining factors. Sometimes as the gardener I find it hard to see the forest for the trees. What needs to be tended is always in my line of sight, and there is always much that needs tending. It is easy to feel overwhelmed by the amount of work to do. But sometime in early September a change comes over Reynolda Gardens. The morning dew is thick and stays long into midmorning. 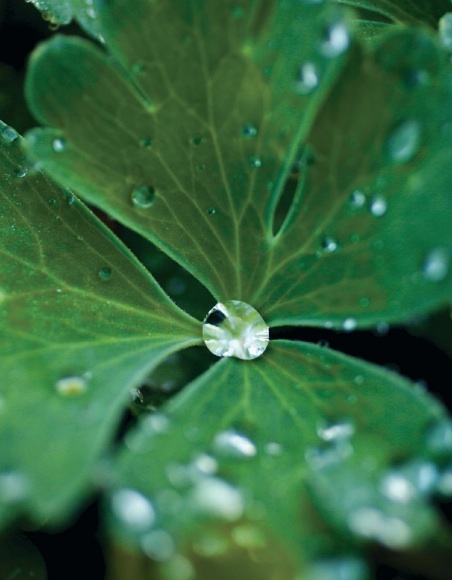 A particular slant of light illuminates every bead of moisture on grasses laden with dew. 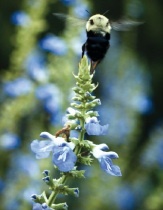 Bees sleep in blossoms heavy with the weight of water. The Gardens are saturated in their own fecundity. It is a time when the Gardens are reaching for their zenith yet redolent of its decline, a period when the inevitable descent of autumn is as evident as the dew soaking through my shoes. 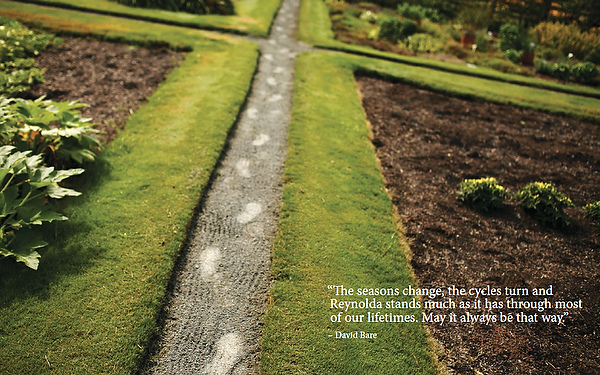 The seasons change, the cycles turn and Reynolda stands much as it has through most of our lifetimes. May it always be that way. 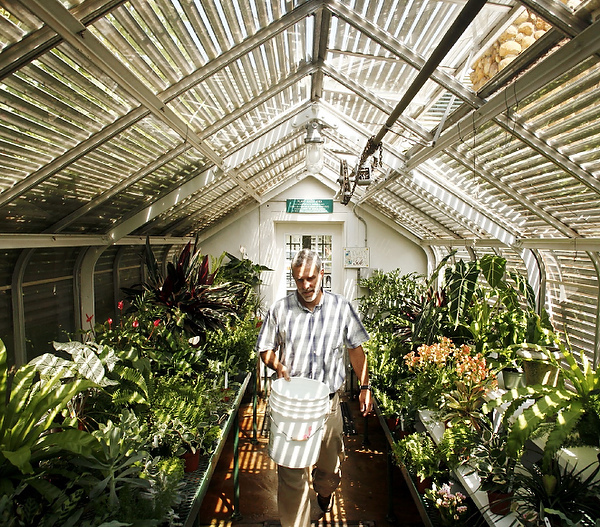 David Bare, garden columnist for the Winston-Salem Journal, has been Reynolda Gardens’ greenhouse manager for 11 years. His daughter, Mary Hollis Williams, is a 2009 Wake Forest graduate. 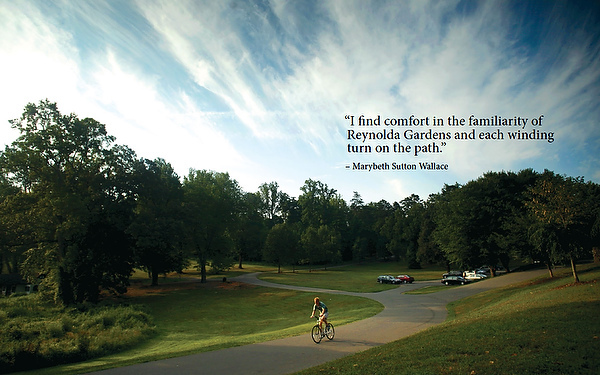 I find comfort in the familiarity of Reynolda Gardens and each winding turn on the path. I have known it since I came to Wake Forest as a student in 1982 and I have walked it in times of sadness and difficulty as well as in times of tremendous happiness and joy. So far from my old Kentucky home in those early days, I found solace by running in the Gardens. Later, the Gardens afforded me inspiration for my best papers for Elizabeth Phillips’ Dickinson and Whitman seminar. Now on weekends my husband McLain (’85, JD ’88) and I walk the same path we ran as students, and we attempt to resolve all the issues of the week, many pertaining to our own teenagers! It cheers me to see fellow-Wake Foresters along the way: Dr. Duke Weeks (’61, MD ’65), attired in gold and black, greets me with his faithful Yorkie Emily, clad in a different colored sweater depending on the day of the week; devoted friends and faculty Herman Eure (Ph.D. ’74) and Clay Hipp bridge the gap from biology to business on their jaunts as they debate the merits of barbecue and whether Eastern or Western reigns supreme; and later in the afternoon I might chance to meet Professor Jim Barefield as he makes his way swiftly to the gate just before tea time. My sister Sandy (’89, MAEd ’90), in our time together at Wake, set a series of Herculean tasks for any potential boyfriend: one such requirement was not to be outwalked in the Gardens by the Sutton sisters. “Can he keep up?” she asked dubiously, when I returned from the Wake Forest Worrell House, after having met McLain. As it turned out, he had us gasping for air by the time we reached the gate. In the ’80s when students were all so enamored with running (and our knees would permit it), we commonly scheduled our social time by running together through the Gardens: that is how Molly Jones Burns (’87) and I met and came to know each other. Molly cemented our friendship by delivering warm Moravian sugar cake to my door in New Dorm. (At the time there was a charming little bakery in the Village.) I can remember Homecoming dates that included a run through Reynolda Gardens after the football game and before the evening’s formal parties. 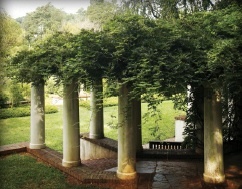 After graduation, when McLain and I visited Wake Forest and Winston-Salem, we looked forward to runs or walks through the Gardens as further opportunities to reconnect with all that is Wake Forest. 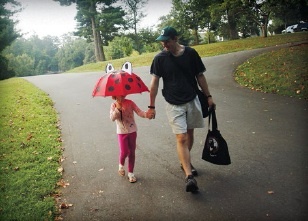 Finally, when our family moved back to Winston in 2005, we resumed our daily treks through the Gardens, feeling about them like a wonderful old sweater that hasn’t been worn in years but feels so comfortable upon rediscovery in the closet. The change of seasons in Reynolda Gardens is what I find most beautiful: in spring, like Wordsworth, and like any good student of Ed Wilson’s (’43), my heart leaps up when I behold a host of golden daffodils on chilly green mornings. Summer brings out the turtles to sun on floating logs. Winter is quite majestic when the grounds are covered in snow and one crunches across the bridge, in awe of the exquisite icicles. But fall is my favorite season because it brings to mind Keats’ “Ode to Autumn” in its mellow fruitfulness. The burnished reds, yellows, oranges of fall are breathtakingly beautiful. These joys I missed when I moved away, and I couldn’t wait to get back to Winston and to Wake to walk through the Gardens and experience that “certain slant of light” in the late afternoon. There is, in walking through the Gardens, for any Wake Forester, a sense of coming Home. Marybeth Sutton Wallace (’86) is a special assistant to President Nathan Hatch and oversees the Wake Forest Fellows and President’s Aides programs. When I was a student, Reynolda Gardens was an escape when I most needed it. After a rough exam or staying up too late working on a paper, I liked to reward myself with a trip there for lunch. The walk alone would generally set me at ease. Returning to photograph the Gardens took me right back to those days. 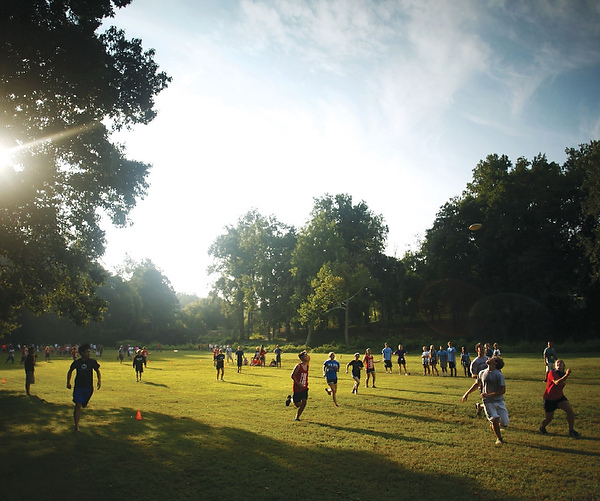 A field of ultimate Frisbee players, runners trotting the pathways and picnics on the grass set the scene exactly as I remember it. Coming back with a camera offered an opportunity to explore little corners of the grounds that I hadn’t investigated before. They are spots I’ll be back to, next time with my running shoes and a load of stress I’m ready to part with. North Carolina photographer Travis Dove (’04) studied communication and studio art at Wake Forest. During his work toward a master’s degree in Ohio, he was named 2007 College Photographer of the Year. His photographs have appeared in National Geographic, Newsweek, Rolling Stone, Our State and various national and regional newspapers. into the sediment of root, stalk, seed, and tip: lake’s fertile memory. The walker in the woods. A boy and his dog in the meadow, dancing. A turtle digging a hole, near the path, slow work. A hut of sticks and straw, childhood regained. walking into my shining web, not a small one, and me in the center. where they go to put their glasses on us. “Lord: it is time. The summer was grand. Let your shadows lie long on the sundials. With a friend or come alone. Emily Herring Wilson (MA ’62) is a friend and neighbor of Reynolda.